*Updated post with new photos. Check out the full gallery too, there are a ton more photos! It’s hard to believe that Kate and I have been living in Alaska for three years now and had not driven the Denali Highway yet. We set out to change that yesterday and it was pretty spectacular. We started out later than we had hoped, because we sleept in were to lazy to finish packing the night before like planned. Then we had to eat breakfast and put gasoline in the car. By the time we got there after 3 hours of driving it was nearly 1 pm so the mid-day haze was in full effect, ruining all of my pictures. Within a few minutes after turning on the rock and dirt Denali Highway we got some stunning views of the mountain. There are tons of small streams along the way, all of them very cold. Probably because we had our first frost overnight. Everything is still pretty green, but you can see the foliage is just starting to change colors. Fall will be here very soon. The Denali Highway is a 135 mile road that runs between the Parks and Richardson Highways. We drove 55 miles of it from Cantwell (On the Park’s Highway) to the Susitna River. There are some great views of the south side of the Alaska Range along the way. The landscape is pretty breathtaking. 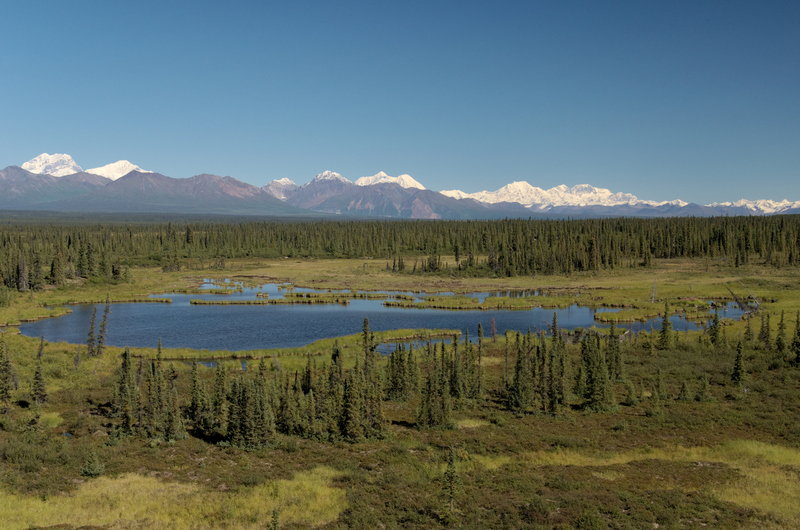 Some of the high peaks of the Alaska Range come into view as we look out over the Nenana River and Valley below. Looking into this valley from above was like finding a lost world. Here’s the view from where we ate lunch. Deborah and Hess are the leftmost peaks, Hayes (the tallest in this region) is dead center, to the right you can see Aurora, and Shand which rise out above the Black Rapids Glacier. The wonderful dog found a caribou bone that still had a bit of meat and sinew. It was great fun for him playing keep-away with us. Then we returned to the car and quickly discovered that his breath was that of rotting animal carcass. The rest of the drive was with the windows down. At nearly 5 pm, after 7 hours of driving and walking around we hit our turn-around after driving down a little side-road on the Susitna River. It looks like there are tons of great camping areas around here so we definitely plan on returning. I stopped near the bridge to take a few panoramas near the bridge. This is an 11 image stitched panorama of the Susitna River. The tall peaks to the right are Deborah (12,339 ft.) and Hess (11,940 ft.). We had dinner at Panorama Pizza on the way north to Denali National Park. It is the best pizza I’ve had in Alaska so far, so if you find yourself on the Parks Highway a few miles north of Cantwell it’s definitely worth the stop. We didn’t enter the Park until 8 pm which offered us a little less than two hours of daylight left (the Sun sets at a much more “normal” time these days). Not far into the park we saw a momma moose and her calf eating on the side of the road. I believe we saw a total of seven moose in the Park. Unfortunately the haze never really cleared up before sunset, but we did see some awesome light while we were in the park. On our way out we just stopped and watched the light change until the Sun was fully beneath the range to the north. We had some spectacular views of Denali bathed in warm light. Here’s the drive from Fairbanks.